Many would be surprised to know that Florence as a city, did not hold much charm for us as its rustic Tuscan countryside did. We are not connoisseurs of museum art and do not quite understand the Renaissance art of Florence. Nor did we strive to understand it. 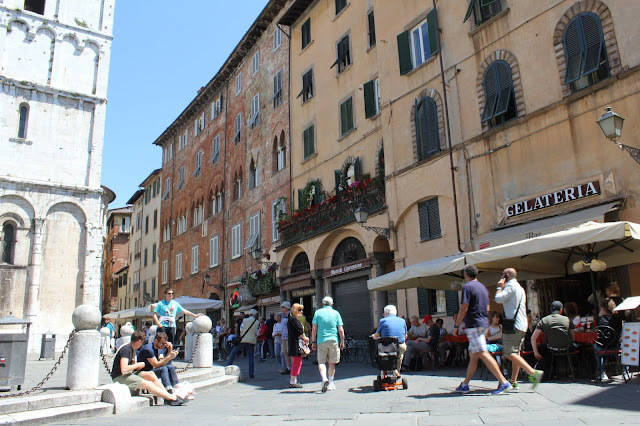 There are so many charming one-day trips from Florence reflecting the past glory of Tuscany that we chose to explore its countryside in our 4-day trip to Tuscany rather than just Florence alone…The Castle of San Gimignano, the medieval city of Siena, the sprawling vineyards in the Chianti wine region, Lucca, Pisa are just a few of the many touristy places, I quote here. We made Empoli our base, a city just outside Florence, and rented a lovely AirBnb for our stay. We had our own ride, so covering Lucca and Pisa in a day was not a daunting task for us. We started off early (around 7:30 am) towards Lucca, leaving behind Pisa to be covered on our way back. This is recommended to avoid the crazy crowds at Pisa in the first half of the day. 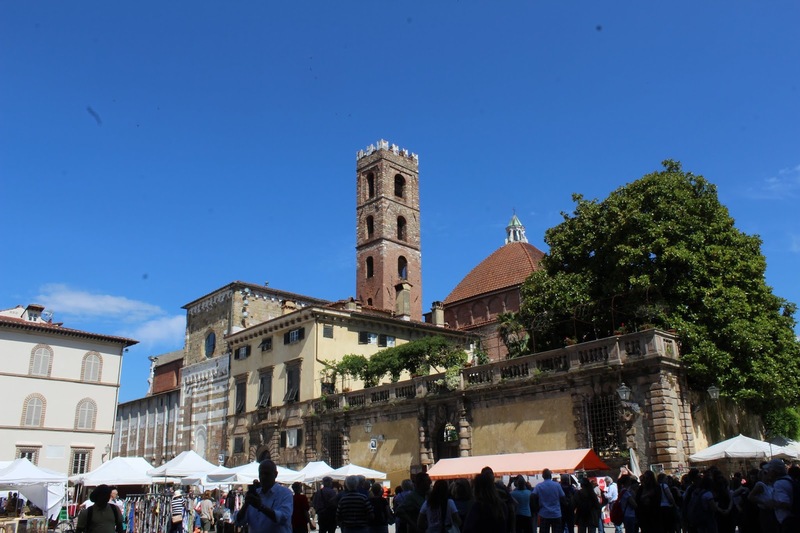 A drive to Lucca usually takes about an hour. Lucca is an ancient city famous for its 16th century city walls. Once upon a time, it was the capital city of Tuscany and held significant commercial importance. The broad, fortifying walls were built to protect the city from invaders. Now, they have become a popular promenade for the pedestrians and bicyclists alike. 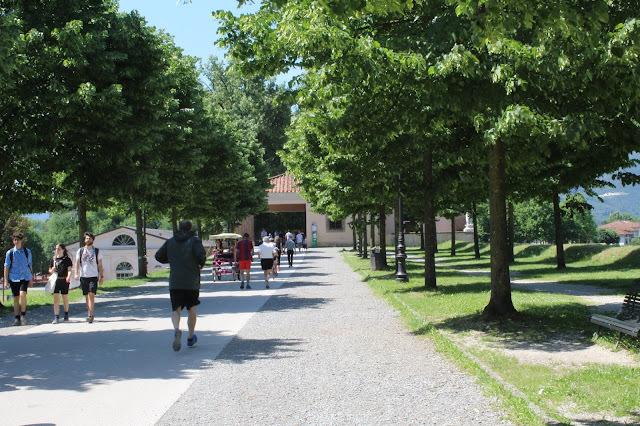 Dotted with benches and shaded with trees on both sides, the path takes one around the city providing panoramic views from top. Our favorite way to explore a city is usually on foot. That’s the best way one can explore the essence of a city, according to us. Not that we had much choice in Lucca, as the medieval city has really narrow lanes and it also gets difficult to navigate around and find any easy parking spot there. However, therein lies the charm of Lucca :). So, we parked our car just outside the city walls and began by climbing atop the wall. The promenade was just so lively… people, pets, cyclists were all over the place and gave a vibrant vibe to the place. Yes, one can rent a bicycle too and explore the entire area peddling! No matter where we walked, we were captivated by the sight of a medieval structure and old residences, some of which are still inhabited. The towers, cathedrals, squares (piazzas as they are called in Italy), rooftops all seemed so surreal as compared to our modern cityscape. It was not long before we descended the wall and passed by the Duomo di San Martino to enter a sprawling square buzzing with a bazaar. 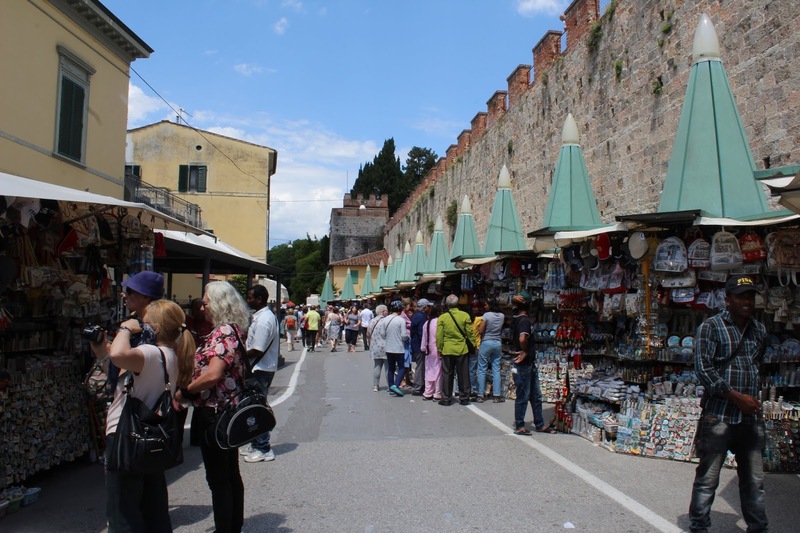 It was the Antique Market of Lucca. Many vintage items were on open display and the energy there was electrifying. I wished I could buy some exquisite glassware but carrying them back home was a task! 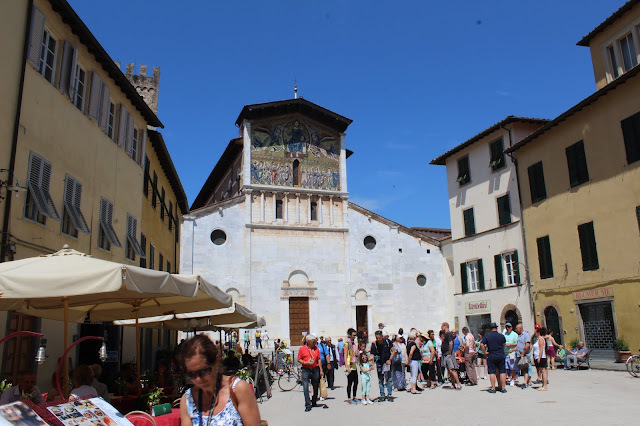 We continued walking through the maze of lanes till we reached the Basilica of San Frediano. The walls of these structures with its frescoes and ancient splendour is still amazing and one feels transported back in time to the medieval era. 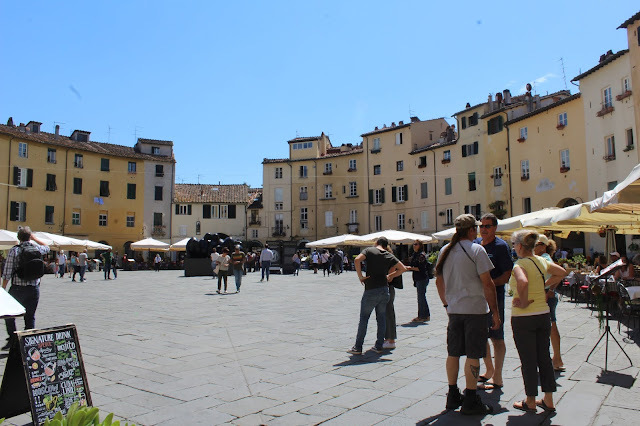 The most notable public square in Lucca is undoubtedly the Piazza Anfiteatro. It was a Roman amphitheatre in the olden days, secured by four gateways and now houses residential buildings built along the elliptical shape of the amphitheatre. San Michele in Foro is another lovely cathedral which one would not want to miss. The architecture of the facade is simply brilliant. 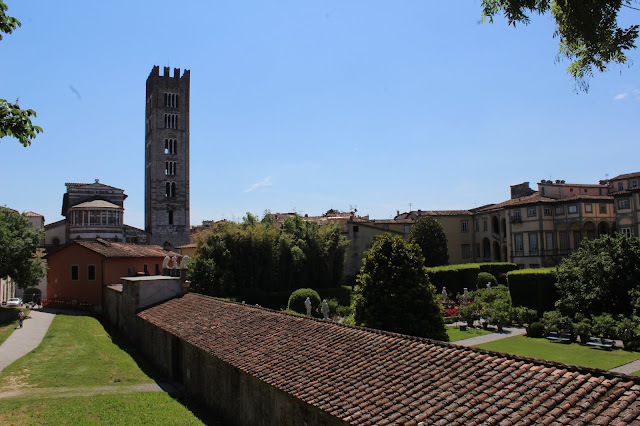 Equally interesting is the Guinigi tower with an amazing roof-top garden of holm oaks. Imagine huge trees growing from the top of the tower! We must have walked for more than 3 hours by then. Lucca is all about experiencing the charm of an ancient city at one's own leisure whilst enjoying a delicious gelato on the go! All the walking around in the heat took us to Gelataria Veneta, one of the older and better known gelato shops in the town. We ordered a pista and a chocolate gelato cone and set off again to wander on the walls. Savouring the gelatos while walking on the promenade was immense fun. It was past noon and the heat was getting on to us. We decided to relax and have some light refreshments in a cafe, which we had spotted near our parking spot. After devouring some freshly squeezed OJ and a quick sandwich, we started our ride to Pisa. 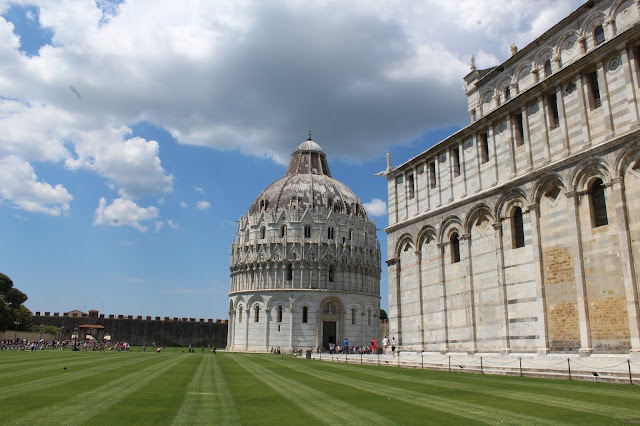 Thirty minutes later, we reached the walls of Piazza dei Miracoli in Pisa. This is a walled piazza housing the Cathedral, the Campanile (free standing bell tower) alongside it, a Baptistery in the background and a cemetry. The grounds of the piazza are sprawling with lawns and paved paths leading to the structures. The piazza also houses a museum inside its walls. It was astonishing to see the tower leaning so heavily to its left and yet standing tall and safe next to the cathedral. 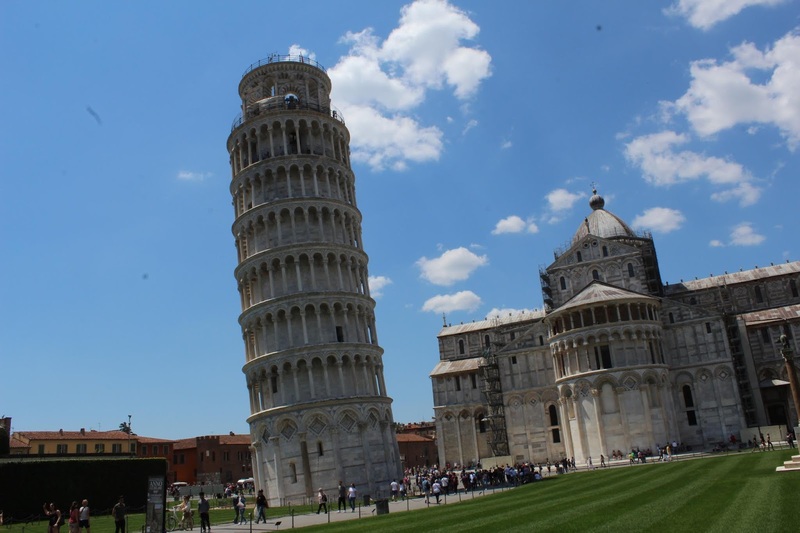 It's serendipitous tilt, which has been attracting millions from all over the world, was caused due to an inadequate foundation laid in the late 12th century. Efforts have been made over the years to stabilise the structure, with the most recent renovation being done around 20 years ago. We explored the piazza in the hot sun and went out on the other side of the wall to grab a delicious veg burger. Mind you! Burgers are not commonly available in Italy, especially in a small place like Pisa. Italy is all about its tradition, pizza and pasta. So when we got a chance, we grabbed the burger from a stall outside the piazza and truly enjoyed it. There are many Bangladeshis selling trinkets and souvenirs outside the walls there. Also, there is a small Indian restaurant serving Indian food and drinks to satisfy us desis.